This year, Ramadan begins when the sun sets on 16 May. Whether it's your little one's first year of fasting or you'd like to explain Ramadan to your non-Muslim child, here are some facts to get you started. And with Ramadan fast approaching, beginning when the sun sets on 16 May, soon we'll be getting all sorts of Ramadan edition questions. Muslims: Nope... not even water! Our little ones who are fasting their first year may not completely understand why we do so, just as their classmates and play dates might be similarly confused. In which case it might be a good idea to explain why Ramadan is such a sacred month for the ummah (Muslim community). Ramadan is the 9th month of the Islamic calendar and lasts 29 to 30 days, depending on when the moon is sighted at the end of the month to signal the following month – Shawwal. The Quran was revealed during the holy month and in Ramadan many Muslims give charity to the poor, attend mosque for additional prayers during the evening and attempt to complete the entire Quran. However, many know Ramadan as the month in which Muslims fast – i.e. abstain from eating and drinking anything from dawn to sunset. If you’re looking for a way to explain to your little one why we do this you can start by saying that fasting is one of the 5 pillars of Islam – the 5 things that every Muslim must do as it makes up the foundation of our religion. But you can also tell them that we fast in order to become closer to Allah. During Ramadan, because we are told to abstain from certain things we are reminded that we often take those things for granted. Whether it’s the delicious sweeties we eat or something as simple as the water we drink, we become conscious of all that we have. This then also reminds us of those who, every other day, aren’t as fortunate as we are, fostering feelings of compassion and empathy. You can therefore explain that Ramadan is a month of peace, understanding and truly getting in touch with your creator. Is it okay for children to fast during Ramadan? There are particular groups of people who are exempt from fasting: those who are old, ill, travelling, at war, as well as women who are menstruating, pregnant or breastfeeding. However, once you hit puberty you are expected to fast and observe the holy month of Ramadan. So why then do we expect children to fast? 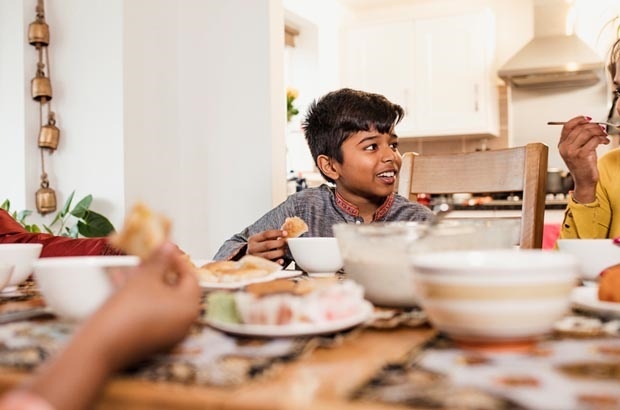 While it is not mandatory for younger children to fast, many families introduce their children to fasting around the age of 6, just to get them to understand and get used to the idea of fasting. Nabeweya Malick of the Muslim Judicial Council says, “Fasting teaches children that their desires are secondary, it is submission to Allah (SWT)’s law which comes first. This is a primary lesson for a believer and would strengthen the young adult when tested with other challenges in life”. To read more about children and fasting click here: Should children be allowed to fast during Ramadan? How can I introduce my children to fasting? After you’ve explained the importance of Ramadan, start children off by giving up certain things. For example, some families believe it’s important to refrain from watching TV during the holy month. You can start there are simply start taking away snack time. Some parents start their little ones off by fasting half day. This can either be meals with no snacks in between or literally having them fast from dawn to lunch time. This is great, because if they’re in preschool, they’ll probably be occupied during that time anyway. On that note, keeping them occupied is a good way to get them through. And the great news is, you can do this while at the same time getting them to learn about the holy month. Try getting them to design their own progress chart or help you make traditional treats for the family to break their fast at sunset. In Cape Town many people make savouries and sweets to break their fast and send plates of eats to the neighbours too. Get them involved in both the making and the delivery. Incentives are also a good way to get them to fast. While we don’t want them to do it for all the wrong reasons, knowing that they’ll get a trip to the toy store usually gives them motivation to do just about anything. Smaller incentives do the trick as well, even if it is simply promising to cook their favourite meal. How did you talk to your kids about Ramadan? How did you introduce them to fasting? Tell us by emailing chatback@parent24.com and we may publish your comments. Should children be allowed to fast during Ramadan?